← Ireland to starboard, or port? Wednesday night grunt in the Row St Kilda to Skye training boat. They said it themselves: “one of the most hare-brained projects Skye has seen for some time.” We would add: beautifully hare-brained. 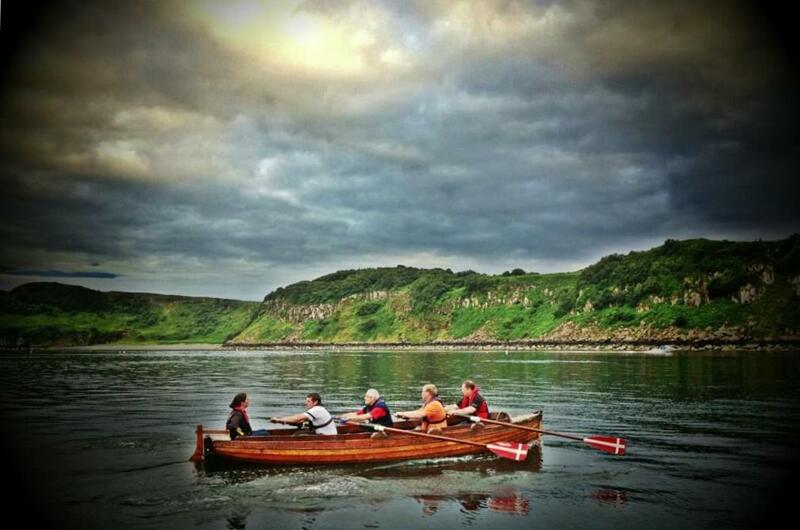 This summer, an intrepid team from the Isle of Skye will raise funds for the RNLI and Young Carers by “attempting” to row from the far flung, almost mythical Hebridean island of St Kilda – to Portree, the principal town and port of Skye; a distance of approximately 100 miles across nothing less than the open North Atlantic. Ocean rowing feats are almost run of the mill these days, piloted by supremely athletic, mentally sorted (or not, depending upon one’s point of view) folk in highly evolved rowing craft that resemble second world war midget submarines. But this one is different; at least the boat is. 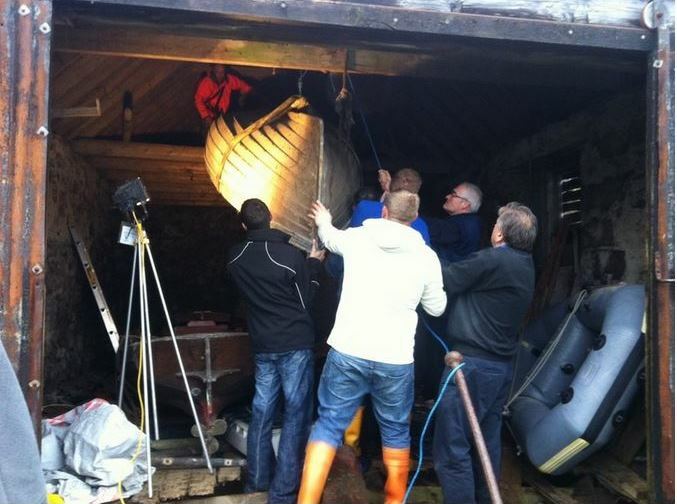 The skiff about to see the light of day for the first time in 100 years. But this is no ordinary rowing skiff. She is a remarkable surviving example of the boatbuilding artistry of Thomas Cublick Orr Jr (1851-1934), Yacht, Launch and Boatbuilder, of Greenock on the Firth of Clyde – perhaps the finest Clyde boatbuilder that most folk have never heard of, and one of yacht designer G.L. Watson’s favourites. By all rights Orr should be long forgotten. His business, inherited from his father, Thomas Cublick Orr Sr (1816-1904), flourished briefly from c.1880 amid the burgeoning late Victorian demand for leisure craft on the Clyde, until it failed financially in 1899. Soon after, Orr moved to the Northumberland shipbuilding and coal exporting port of Blyth, probably to manage a local ship’s boats building business. Certainly he was a boatbuilder at Blyth for the rest of his working life. A trainload of rather fine looking ship’s boats ready for delivery from Blyth South Harbour. Yet, in 1980, when I began enquiring about the rich history of yacht building on the Firth of Clyde, Orr’s reputation there – as one of the best – still lingered in the memory of older retired boatbuilders and professional yacht crewmen I’d had the pleasure of meeting. Some, in their 90s, could remember back to the last few years of the 19th Century. I learned from more than one contact that T.C. Orr Jr had initiated the beautiful “round-stern” punt, or yacht’s tender, that became indigenous on the west coast of Scotland from the 1880s through 1930s – developed from the local Loch Fyne Skiff style fishing sloops. Exquisite round stern punts at The Fife Regatta 2013. 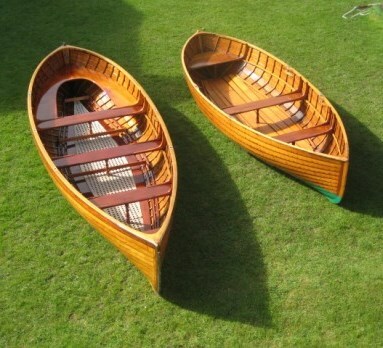 These fine punts, together with the light and fast competition rowing skiffs – and exquisite ship’s boats for the huge sailing and steam yachts being built on the Clyde to the designs of G.L. Watson and his contemporaries – that Orr was known for, went unrecorded, as far as we know. But his body of larger work – steam launches and sailing yachts up to c.65ft (19.8m) long – left its mark, recorded in Hunt’s and Lloyd’s yacht registers, museums and even on film*. One of his sailing yachts, from 1887, survives. Orr stoutly built the characterful gaff ketch, Nell, to the plans of our hero, G.L. Watson (design no.137), commissioned by the artist R.C. Robertson of Windermere for West Coast of Scotland cruising. 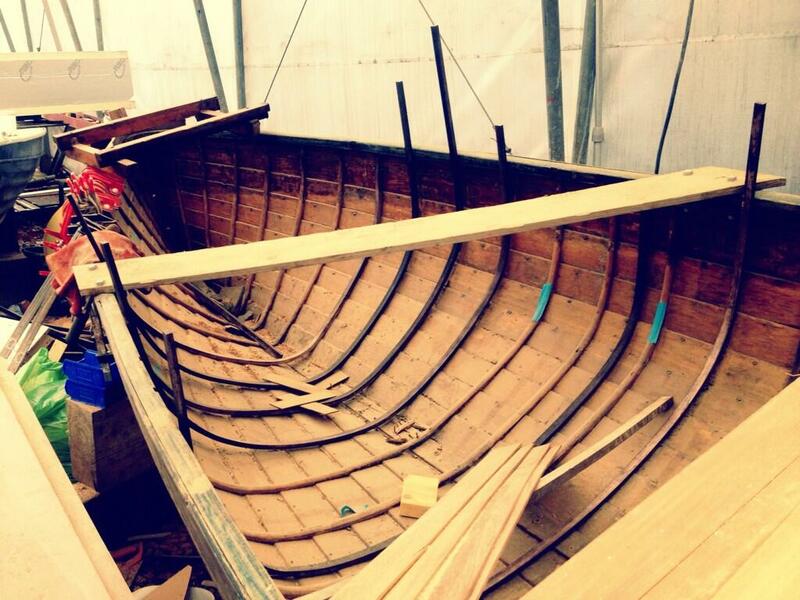 She was probably the first yacht built on Loch Fyne Skiff lines; the first of many. The gaff ketch Nell, designed by G.L. 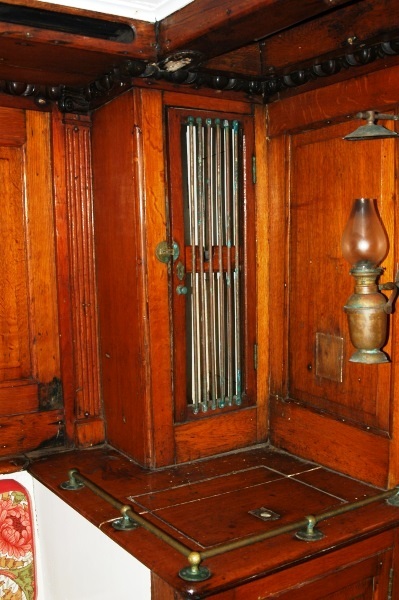 Watson; built by Thomas Orr Jr, 1887. It was during an 1894 cruise aboard Nell with Robertson that the not yet famous Scottish colourist Samuel Peploe was first introduced to the artists’ theme park that is the Hebrides – and his future wife Margaret, from Lochboisdale, South Uist, who just happened to be working in Castlebay, Barra when Nell anchored there**. Nell spent many years of dotage based at London’s St Katherine’s Dock. 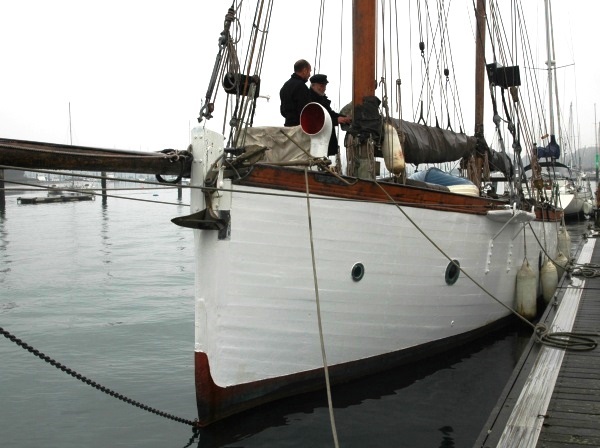 She is included in the UK National Register of historic Vessels, and is now undergoing restoration at Honfleur in northern France under the supervision of naval architect Guy Ribadeau Dumas. Nell’s 1887 interior is superbly original. Nell, a yacht that exudes character that can hopefully be retained in restoration. Greenock’s McLean Museum and Art Gallery’s wonderfully eclectic collection includes this superb 156cm long working model of a steam launch (below) made by T.C. Orr Jr, for which he was awarded a gold medal at the Edinburgh International Exhibition of either 1886 or 1890. Gold medal winning working steam launch model by T.C. Orr Jr.
Mimine (2½-Rater) launching, 1894. Could the man on the foredeck be Orr himself? Note the iron sledge in use as a ‘spreader bar’ to prevent the lifting slings from squeezing her topsides, and the well protected pine deck. 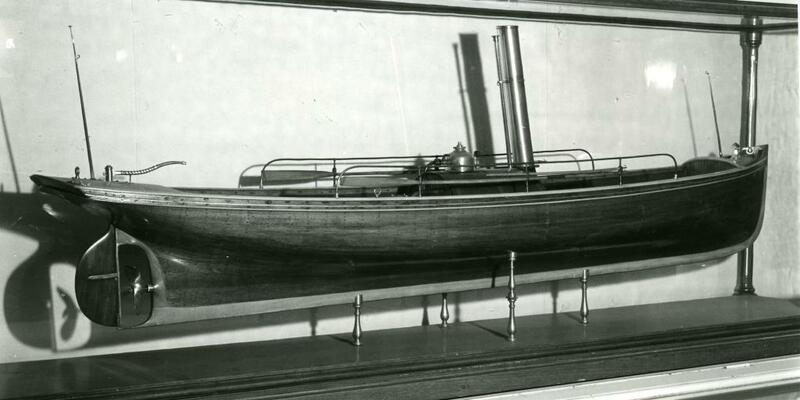 Another fascinating relic at the McLean Museum is the above image of the 1894 launching at Victoria Dock, Greenock – not far from his East Blackhall Street boatbuilding shop – of the radical for the time, fin keeled, beamy, bermudan rigged sloop, Mimine, designed by William Fife Jr (design no.319) and built by Orr for Greenock sugar refiner Duncan F.D. Neill. Neill would later become Sir Thomas Lipton’s America’s Cup yachting advisor. 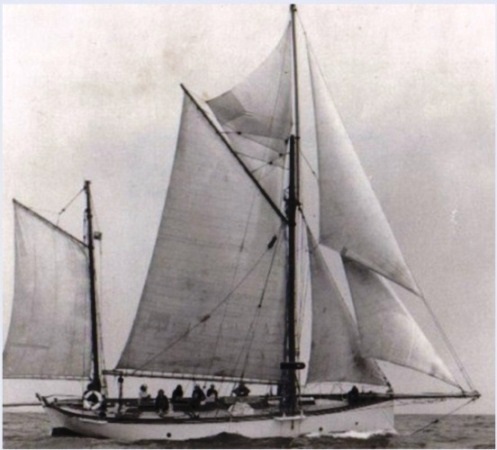 Mimine was probably the first bermudan “shoulder of mutton” rigged yacht to be designed and built on the Clyde – maybe even Europe. Perhaps this was Orr’s downfall: taking on tricky jobs requiring new ways of thinking while pricing too cheaply. Only conjecture, but he was in the midst of building an even more complicated G.L. Watson design when his business crumbled. 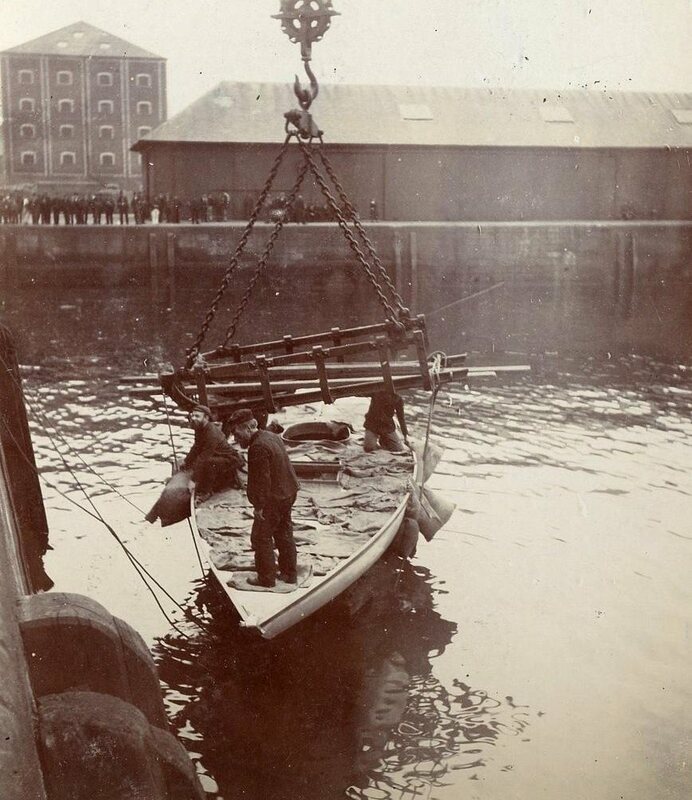 While Orr’s smaller builds would have taken shape at his East Blackhall Street shops, it seems feasible that the c.65ft (19.8m) shallow draft centreboard cutter, Marguerite (G.L. Watson design no.381 – he’d been busy since no.137, Nell) may have been built at his slipway further to the east at James Watt Dock: The Clyde Patent Yacht Slip Company. According to Orr’s sequestration papers of 1898-1899, he was a partner in this business with Robert Steel Gilmour (Engineer) and James Gush (Submarine Diver), and it seems to have got into difficulty first. Perhaps this failure resulted in his subsequent sequestration, and the loss of a boatbuilding business that should have been viable. We last wrote about Nell, her builder and Loch Fyne Skiffs briefly here, which caught the attention of Thomas Orr Jr’s great great-granddaughter, Glenys Shearer, in Australia. We noted for future checking out that Glenys had mentioned an Orr-built racing skiff perfectly preserved at the Clan Donald Centre at Armadale, Skye. 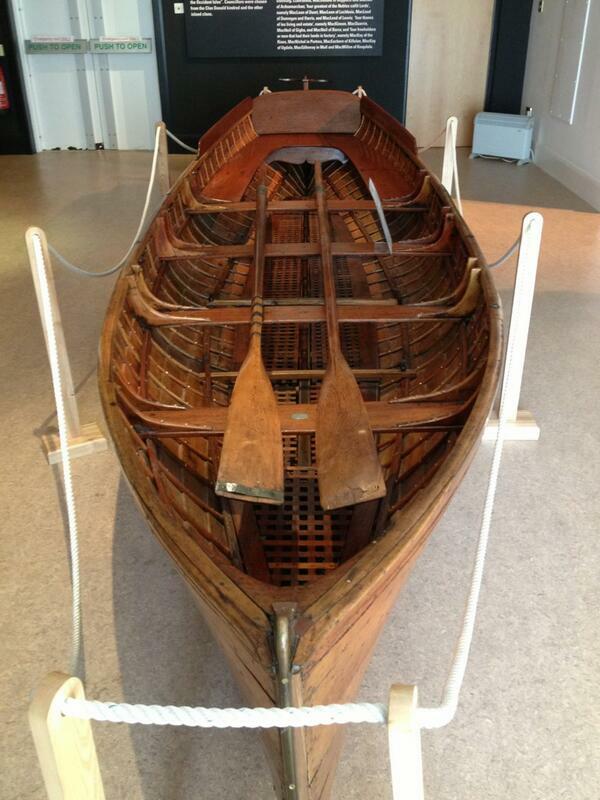 18ft Thomas Orr Jr skiff at the Clan Donald Centre, Armadale, Skye. Built for the MacDonald family of Redcliff, Portree c.1897. 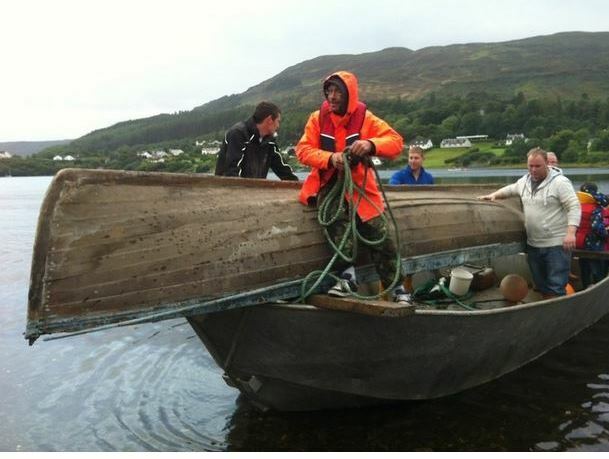 The Row St Kilda to Skye skiff was built for their relatives at Viewfield, Portree. More recently, we stumbled upon the wonderful Row St Kilda to Skye project and their very similar skiff, built for a branch of the same family that commissioned the “Armadale boat”. The time seemed right to tell Thomas Orr Jr’s story, and celebrate that fact that 115 years after his business stopped, and 80 years after he died, his spirit lingers nicely. 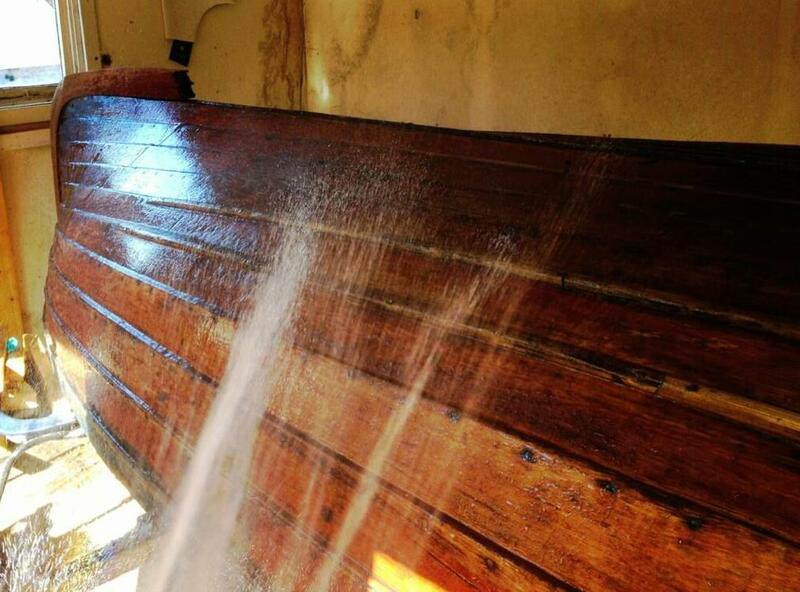 Broadford, Skye-based boatbuilder, Iain MacLean, is undertaking the structural restoration necessary to make this beautiful and, as yet, nameless skiff ocean worthy. Inevitably Iain must replace most of the structural members, but is saving almost all of her larch planking. We sometimes call it “accelerated maintenance”. Her re-launch is planned for April. Keeping her sweet through the warm summer of 2013. Keep track of progress at the Row St Kilda to Skye website, at their Facebook page and via Twitter. * Thomas Orr’s last yacht build at Greenock in 1898, the G.L. Watson designed shallow draft centreboard cutter, Marguerite, was a very interesting and unusual design, especially for a man who professed a dislike of centreboards. She gained her stability from slack bilges and wide beam, as would many later American centreboard cruiser-racer designs in 1950s and 1960s heyday of the CCA Rule, such as Olin Stephens’ Finisterre, and the much sought after Hinckley Bermuda 40 production yawl. Marguerite was commissioned by Northumberland shipowner (later Sir) James Knott of the Prince Line; her centreboard may have been to allow access and taking the bottom (she was originally fitted with stubby, very long external bilge stringers) at some of the English north east coast’s few sheltered – but very shallow or drying – anchorages. In 1916, on the loss of two of his sons in the first world war he sold The Prince Line for £3m and devoted the rest of his life to philanthropy. Whilst we have no proof, it is worth surmising that Knott’s philanthropic nature may have existed 17 years earlier, facilitating his yacht’s failed builder’s face-saving move from Greenock to the north east of England. What there is no doubt about is that Marguerite enjoyed a long life – some of it in the limelight after the second world war. Under the ownership of Commander Claud L[ombard] A[ubry] Woollard, Royal Navy Retired, she operated out of Poole in Dorset, as English Rose II, a sail training ship for female sailors (presumably WRNS cadets). English Rose II, 1956 Tall Ships Race. The proof is here in these quaint old newsreels. The first (at 8-10 seconds – blink and you miss her!) shows English Rose II attending the start of the first ever “Tall Ships Race”, from Torbay to Lisbon in 1956. Despite the commentary, she didn’t take part in the race; perhaps just as well, as her dramatically cut down rig (probably because her centreboard had been removed) wouldn’t have offered great performance. At the stills link one can study her at more relaxed pace. The second, silent clip shows her on the River Seine at Paris. She’d become very cluttered on deck, but there is no mistaking her G.L. Watson lines. English Rose II last appeared in Lloyd’s Register of Yachts in 1970, based in Malta. Could she still exist? ** More information on Samuel Peploe and some of the paintings resulting from his Hebridean cruises aboard Nell here (pdf file download). Thomas Orr Jr was one of a select group of Firth of Clyde boatbuilders favourited by Glasgow-based yacht designer to the world, G.L. Watson (1851-1904), to build his small to medium sized sailing and powered yacht designs, and ship’s boats for Watson’s magnificent large sailing and steam yacht designs more often than not built at neighbouring shipyards. Read the whole beautifully illustrated story in Martin Black’s biography, G.L. Watson – The Art and Science of Yacht Design – here. This entry was posted in America's Cup, art, boatbuilders, boatyards, Clyde yachting, Clydebuilt, film, Firth of Clyde, G.L. Watson, G.L. Watson & Co., G.L. 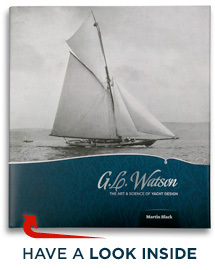 Watson clients, object of desire, rowing, Sail and oar, Steam Yacht, yacht design, yacht designer, yachting history and tagged Blyth, Clan Donald, coastal rowing, Cublick, Duncan F.D. Neill, English Rose II, Iain MacLean, Loch Fyne Skiff, Marguerite, Mimine, Nell, ocean rowing, Portree, Quidditch, Robert Cowan Robertson, Samuel Peploe, ship's boats, Sir James Knott, Skye, St. Kilda, Thomas C. Orr Jr, Thomas C. Orr Sr, William Fife Jr. Bookmark the permalink.